Here's another relatively recent feature that was never given much chance to find an audience. 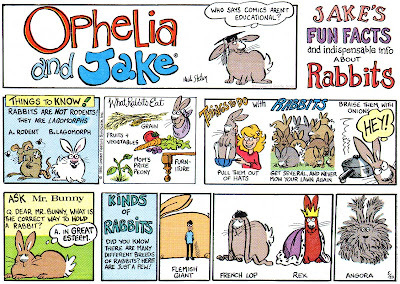 Ophelia and Jake was, I can safely guarantee, the only syndicated strip ever about a girl and her pet rabbit. The strip was syndicated by United Feature Syndicate from January 25 1988 to August 18 1991. I don't know that I'd call it a great strip, but it certainly had a different hook, and cartoonist Heidi Stetson had a really fine off-kilter sense of humor, especially evident in the second example above. Maybe newspaper editors blew it off as a Calvin & Hobbes wanna-be, which it certainly wasn't (editorthink: kid plus animal = Calvin & Hobbes). Maybe the resemblance of Ophelia to another comics page character hurt it (editorthink: kid looks like Luann = must be Luann, which I already run or already passed on). Or maybe the target audience was the problem (editorthink: strip about pre-teen girl + pre-teen girls not big newspaper buyers = waste of space). 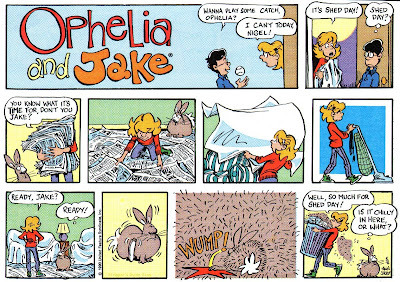 In any case, Ophelia and Jake ran in very few papers in its short run and then hopped off to that big rabbit hutch in the sky. You made my day! My son looked at Google images this morning and found this. I had a lot of fun doing this strip, and have always been grateful for the opportunity. Never knew that anyone thought I was copying "Luann", as I never saw that strip until well after I started doing this. I have endless admiration for Bill Watterson as one of the truly great cartoonists of our times (well, ever, actually) but dang, the strips are full of kid + animal set-ups, so it seems a little unfair! That is the exact point I was trying to convey. Newspaper editors rarely put any deep thought into their choices for a comics page. All they see is surface. I don't KNOW that any editor actually thought any of the things I mentioned, but knowing how little truly intelligent thought goes into choosing a new strip I suspect that unfair, ridiculous comparisons like those I dreamed up were made. We have always missed Ophelia and Jake. We loved it because at the time, I had a housetrained rabbit and we saw many similarities between Jake and my Jolson. We loved Ophelia and Jake. I cherish the memory of Jake meeting a Lop and saying that he'd thought it was a second. Also loved Nigel's Yo Yo Ma lunchbox. Classy kid! Thanks for a lot of laughs and chuckles. Excuse the lack of posts this week please. Had a busy week. Wife had a health scare (turned out to be a false alarm thank goodness), and I was favored with over 200 pages of notes from Alberto Becattini that I've been working at melding into the Guide listings. So where did we leave off. Oh, yeah. Some readers were arguing that the little game I came up with (see last post) was philosophically off-balance, that the classic strips are there because they've earned their places, and that the new strips coming out by and large blow. Hmmph. I don't have many kind words for those 'classics' that hang onto their spots like grim death. Most of them are about as funny as a visit from the reaper. But yeah, I'll agree that I too shake my head when I see many of the new syndicate offerings. I am certainly sick to death of new features that are chosen not based on quality but in their presumed appeal to market sectors. And just how many family sitcoms do we really need? And new features by creators who already have a place on the comics page really get me steamed. Oh good, now creator X is twice as overworked and both features will suffer (often the first one wasn't exactly a classic to begin with). But there are some great new features that come on the scene, too, and by and large they never get a chance because of those entrenched so-called classics. 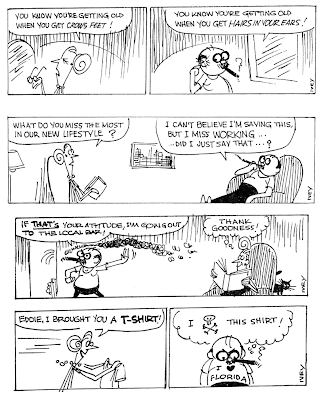 Today I spotlight one of my favorite recent strips, an undeserved obscurity. Lennie Peterson's The Big Picture was syndicated by Universal Press Syndicate to a paltry list of papers from November 29 1999 to August 8 2004. Peterson brought the autobiographical comics form that has become so popular in indy comic books to newspapers and did a great job of it. The strip was not just amazingly funny but also palpably authentic, a rare quality for newspaper strips. Lennie, as you can see in the samples above, wrote about his experiences, including his cartooning, with plenty of self-effacing humor. How he got some of his strips past a syndicate editor, especially the ones lambasting other newspaper comics, I can't imagine, by I'm sure glad he did. Unfortunately there are no reprint books of Peterson's syndicated The Big Picture strip, but there is one that collects his pre-syndication magazine strips. You can find it used on ABE or Amazon though copies tend to be a bit pricey (proof that Peterson made an impression on the few people who got to read it!). Lennie also has a Big Picture website, but it harbors a rather nasty virus. I ignored Google's warnings and went to the site and it did indeed infect my computer. Ad-Aware fixed the problem, but my advice is to steer clear until Peterson fixes it. At first the drawing here didn't do much for me, then I mentally compared it with "Cathy" and "Dilbert" and changed my opinion ... and the guy is obviously a good writer who knows how to pace a gag. I'd never heard of this before, and that's really too bad. I remember this strip. Thought it was good. He ended "Big Picture" around the time Lennie's cat (who appeared in the strip) passed away, which was written into the final few weeks of the strip. A Game For You -- "How Stale Are My Comics?" Yesterday I received a giant package of Sunday comics sections from papers all around the country, mostly dated in 2000, from Mark Johnson. Thank you Mark!! Dilbert started in 1989, Peanuts in 1950, Zits in 1997. So in 2009 those strips are respectively 20, 59 and 12 years old. You add those together to get 91 years, and divide by 3, the number of strips. The average age of the comic section is 30.3 years old. Okay, get it? A few comments. First of all, way to go Boston Globe! And everyone says you're a dinosaur. Sheesh, they couldn't be more wrong. Second, a few papers really gave their ages a major shot in the arm with the inclusion of Snuffy Smith (81 years old in 2000) and Ripley's Believe It or Not (82). Third, I'm sad to say that there wasn't a single paper that contained a feature that was zero years old (in other words, started in 2000). And finally, a note to you newspaper publishers that it sure would be keen if you'd put the name of your %#$@*! paper on the masthead. I wanted to compare these averages, which seem to center around the high 20s, with a current paper. All I had to work with is my own local paper, the Leesburg Commercial. Things sure aren't looking good here in Leesburg. I have 32 features and an average age of 39.8 years. Hmm. Leesburg and Jack Benny have something in common. So your assignment for today is to pull out the last Sunday section or daily comics page of your paper (you do subscribe to your local paper, right?) and answer the question ... How Stale Are My Comics? Report your results right here and let's see who has the best and the worst. If you have trouble with this because you don't know when a strip started just drop me a line here and I'll supply you with the necessary raw data. But I don't subscribe to a newspaper, and therein lies the problem. The only halfway decent daily was (I stress was) the L.A. Times, but a subscription was very expensive and I only read some 10 or 15 pages and threw the rest out. Still, I suspect the Times' comic age is lower than many papers. Whenever I pick up a copy I find a couple of strips I've never heard of. Unfortunately all seem cut from the same cloth: two or three oddly-underdrawn characters talk for two panels to set up a mild punch line in the third. Maybe if I read a paper regularly I'd warm up to one of these strips, but most seem to have achieved in a year or two the tedium it took Snuffy Smith nearly a century to achieve. I checked my paper (the Denver Post) and found an average age of 23.57 for the Sunday comics page. I think the number of comics carried is also worth noting - having a large number allows space for new comics without ditching the older stuff. The Denver Post carries 10 comics created within the past decade out of 44 total - a paper with fewer comics could have a lower average age but still carry fewer young features. The implication here is that newer, i.e. younger, is better and that older is bad. Are comic creators supposed to be put out to pasture when they reach a certain age? Smurfswacker is correct, there's a blandness in a lot of the newer comics I've seen as well. What should be far more important to note is not the age of the strip but the timelessness of the characters. Newspaper comics were created, often in league with publishers, as entertainments for readers, not showcases for creators. The best of those comics have endured because of the timelessness of the characters that have been created. New creators who have not broken into the same ranks have the mass appeal of their creations to blame, not "crowded" comic pages. The comic sections I sent you were mainly samples from American Color (Buffalo NY), who printed sections for many papers, including the generic ready-print ones for very small papers. I also sent material from 1998-9 and 2001, hope you recieved them as well. The reason most papers run older strips is that they're safe with them. Few editors want to set out with a new strip at the cost of dropping one that's been in place that will potentially disappoint some percentage of readers, or,take away any space that is or could be used for advertising, if the section is big enough. Another reason for the lack of energy in the modern comic section is that there are few markets left with competing sunday papers. The single supplier of a color comic section, then, has no reason to experiment or take a risk; what he has will always be the top strips. He has no rival for them. If a new strip suddenly gets very popular, like "Calvin & Hobbes" did in the 90's, the editor can get it, no prob. As the creator of that strip insisted clients HAD to run it on the cover to get it, it created possibly the highest amount of sameness ever seen in the comic section world. New York - Louis Dalrymple, the cartoonist, whose wife is a Baltimore woman, was removed from his home at 138 East Twenty-ninth Street this afternoon to a Long Island sanitarium. He is said to be violently insane, and small hope is given of his recovery. His condition had given much anxiety to his friends for several weeks. He brooded, they say, over the troubles caused by his divorce from his first wife, formerly Miss Letitia Carpenter, of Brooklyn. He became violent to-day, and was found wandering in the street near his home. Seven years later Dalrymple married Miss Ann Good, of Baltimore. The wedding took place in New Jersey. He moved to Greenwich, Conn. In the years that followed he worked at different times for papers in Chicago, Philadelphia and Baltimore. Then he drifted back to New York. He had become prey to all kinds of hallucinations, and was so changed that his friends hardly knew him. Louis Dalrymple, one of the most famous cartoonists in America, has been taken to a sanitarium on Long Island. He is insane, probably hopelessly. For weeks the noted artist's condition has been a source of grief to his friends. Early this week he became violent. Recently he was found in a frenzy, chasing children about the streets in the neighborhood. Those who knew Louis Dalrymple's story are convinced that marital troubles affected his mind. Alimony demands were made upon his income through a divorce suit and he brooded over an enforced exile from New York and an ever-growing desire to return here. About fifteen years ago Dalrymple, then forging to the front as a cartoonist for Puck, married Miss Letia Carpenter, a pretty brunette of Brooklyn. Their life together was not happy. The wife obtained a divorce on statutory grounds. By the terms of the decree she was awarded their handsome home on Madison street, Brooklyn, where she still lives. The court denied the husband the right to marry again in this state, and ordered him to pay his wife $75 a month in weekly installments. Seven years later Dalrymple met Miss Mary Ann Good, an exceedingly attractive young woman, belonging to a good Baltimore family, who had come to New York on a visit. He eloped with her to Jersey, and they were married there. But Dalrymple was compelled to go on paying his former wife $75 a month as long as he lived within the jurisdiction of the state courts. He finally decided to leave New York. Mr. and Mrs. Dalrymple moved to Greenwich, Conn. where he contributed to Judge and other comic publications, sending his copy in by mail. He used to slip into New York on Sunday, when process-servers were powerless and sheriff's officers could not nab him. The Sunday visits only added to his desire to return to this city. He resolved to put a good stretch of continent between him and the temptation. In turn he was employed on the staff of the Philadelphia Press, the Baltimore News, the Pittsburg Dispatch and the Chicago Tribune. But a demon of unrest kept driving him on -- he couldn't get settled and be satisfied anywhere. It was a wander-lust which fed on his brain. A few weeks ago the Dalrymples came back to town and took lodgings in Twenty-ninth street. "Not even the fear of Ludlow street jail can keep me away," the big artist told his friends. "Good old Broadway kept calling me, and I had to come." The friends noticed a change in him. Dalrymple, once one of the handsomest men in New York, was thin to emaciation. He was painfully nervous. He wandered in his speech. These things kept growing worse. He imagined that Tammany workers had drugged him on the night before election, and he threatened to kill Mayor McClellan. He was found sketching himself while looking in a mirror in the lobby of the Fifth Avenue Hotel. His antics necessitated his forcible removal from the Waldorf-Astoria. Later he became violent. The physicians hold out little hope of recovery for the talented cartoonist, who in his day had made millions laugh. Louis Dalrymple, the cartoonist, died on Wednesday night in the Long Island Home, at Amityville, after having been in a stupor for nearly three weeks. Death was the result of acute paresis, the symptoms of which were unsuspected until three months ago. About fifteen years ago Dalrymple's political cartoons were a feature of Puck. About that time he married Miss Lelia Carpenter of Brooklyn. She later sued for a divorce, which was granted. Afterward Dalrymple married Miss Ann Good of Baltimore and left the State. His cartoons were seen successively in Chicago, Philadelphia and Pittsburg papers. Last summer he returned to this city, and soon after that showed signs of nervous disorder. His wife had him removed to the sanitarium. Mr. Dalrymple was 42 years aold. He was bron at Cambridge, Ill. and came to this city to study art when 16 years old. He will be buried in Baltimore.